As part of an overall positive lifestyle including choosing healthy foods and exercise, olive oil offers benefits to help us age more gracefully. 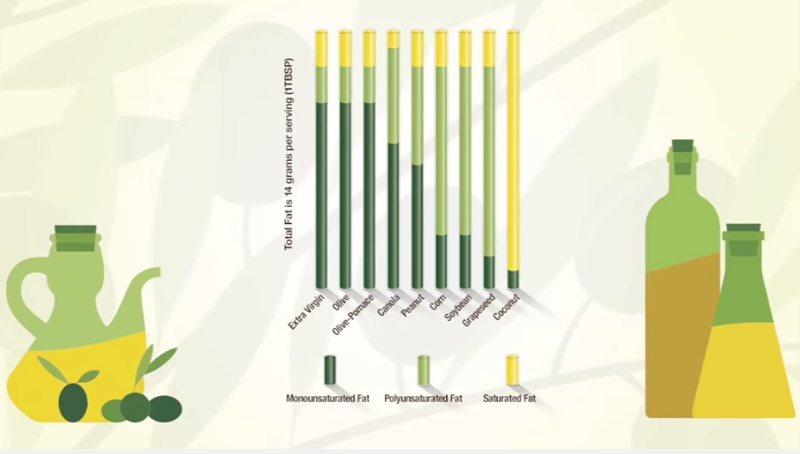 Our bodies actually need fat for heart, brain and neurologic health, but it is important to understand the different kinds of fat and that monounsaturated fats, MUFAs, are the optimal choice. Of all the common cooking oils used in North America, olive oils contain the highest percentage of monounsaturated fat! The key is to always consider the big picture and incorporate olive oil as a replacement for less-healthy fats whenever possible. The evidence of the benefits of MUFAs in olive oil is so plentiful the Food & Drug Administration approved a health claim for olive oils in 2004. 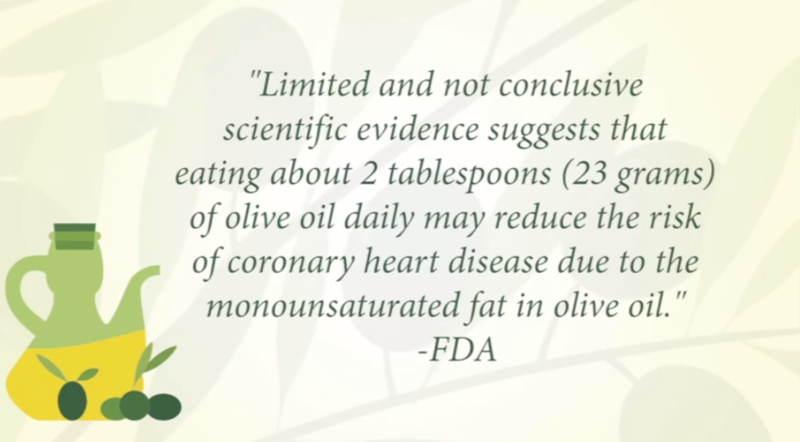 To achieve this possible benefit, olive oil is to replace a similar amount of saturated fat and not increase the total number of calories you eat in a day. Olive oil has a beneficial effect on both LDL, the low-density lipoprotein known as the “bad” cholesterol, and HDL, the high-density lipoprotein known as the “good” cholesterol. The 70 to 80 percent MUFAs in olive oil are known to help lower total cholesterol as well as LDL cholesterol, and also to improve the LDL to HDL ratio. This positive effect on cardiovascular health reduces the risk of thickening of the arteries known as atherosclerosis, which can lead to conditions such as heart attack, stroke, and chronic heart disease. The primary MUFA in ALL olive oils is Oleic acid, also known as Omega-9. Oleic acid has been shown to exhibit anti-inflammatory properties which reduce the risk of a number of age-related conditions such as cognitive decline, cancer and depression. Olive oils also contain minor compounds like sterols that lower cholesterol and have anti-inflammatory, anti-bacterial, anti-fungal, anti-ulcerative, anti-oxidant and anti-tumor properties. Beyond heart-healthy benefits, a 2012 study showed that consuming salad greens and vegetables along with a MUFA such as olive oil increases the body’s absorption of total nutrients. Take advantage by replacing heavy store-bought dressings with olive oil or home-made dressings using an olive oil base. In addition to absorbing more nutrients, you’ll also help reduce cholesterol and sodium!